I just wanted to thank you and your staff. Wally seemed to have a great time. 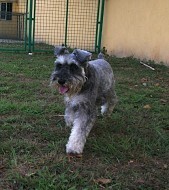 Our Ayi (who went to pick her up) is usually very skeptical about our kennel choices and was very impressed by your operation (I had visited before).